First, players are given insider information each round. This information dictates how a stock's value will change at the end of the round. By privately learning if a stock is going to move up or down, each player has a chance to act ahead of the market by buying or selling at the right time. 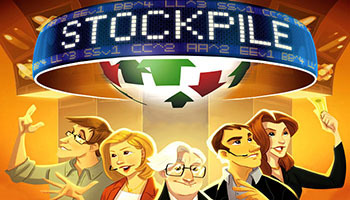 Second, players purchase their stocks by bidding on piles of cards called stockpiles. These stockpiles will contain a mixture of face-up and face-down cards placed by other players in the game. In this way, nobody will know all of the cards in the stockpiles. Not all cards are good either. Trading fees can poison the piles by making players pay more than they bid. 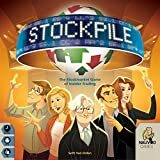 By putting stocks and other cards up for auction, Stockpile catalyzes player interaction, especially when potential profits from insider information are on the line. Stockpile is a fast-paced economic game of corporate investments, insider trading, and market manipulation. Each player acts as a private investor with the goal of amassing the greatest net worth. We suggest playing Stockpile at least once with more than two players before trying the 2-Player Variant. The 2-player variant plays similar to a 4-player game. However, there a few changes to the round's phases. Each player will start with $30,000 in money, instead of $20,000, and still receive only one starting stock. Each player also receives 2 Bidding Meeples (red or blue). Each player is randomly dealt two pairs of Company Cards and Forecast Cards.